Download free sample eBooks in PDF and purchase the complete version. It's simple and secure. Receive a free gift with your purchase. Go green, save the trees, and buy eBooks. Subscribe for free to read about various topics such as spirituality, health and well being, physical fitness, sexuality, same-gender-loving and gay and lesbian subjects, finance, HIV/AIDS, books, music, African American history and topics, race issues, some political issues and current affairs. This magazine endeavors to inform, inspire, and liberate. Browse and purchase paperback books, read book excerpts, review the bios of each author, and join the mailing list for up-to-date book releases and discounts. Download free eBook sample and purchase at ChumaSpiritEBooks.com. JERSEY CITY, NEW JERSEY – FEBRUARY 2009: Taylor Siluwé authors his first short story collection entitled Dancing With The Devil. Read complete press release here. ATLANTA, GEORGIA – FEBRUARY 2009: Fisiwe authors her second book of memoirs and poems entitled More Than Mortar and Stone – The Meandering Mental Path of a Brokenhearted Woman. Read complete press release here. ATLANTA, GEORGIA – JANUARY 2009: Chuma Whahid Rasul, also known as Christopher Hicks-Marshall, independently publishes and releases his third book of memoirs and poems entitled My Ancestors Traveled Them Home. Read complete press release here. 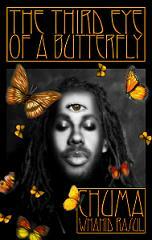 With the purchase of any eBook, receive the paperback version of The Third Eye of a Butterfly as a free gift. To redeem this offer, click on the image.